The Series 2000 material lift is build for heavy material such as steel beams. It is capable of continuous work. This compact material lift offers strong mast design and an excellent cabling system. The shorter mast sections allow the 2000 material lift to travel through doorways without tripping and to fit nicely into vehicles with small storage space. The Series 2000 material lift has reversible forks. By pulling plunger pins, forks can be repositioned for added height or just to get flush with the ceiling. The Series 2000 material lift is ideal for compact storage. Its leg lock mechanism releases with the push of a button and locks in the stored position. 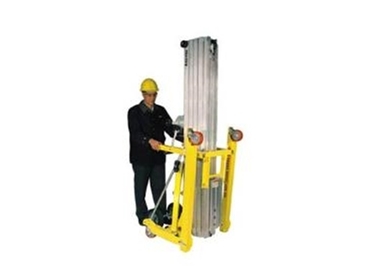 Leg rollers allow the lift to be wheeled around. Its forks can be removed by simply pulling plunger pins. The Series 2000 material lift is available from Kerrick Industrial Equipment .